History is usually a reading of the past with the eyes and spirit of the present. 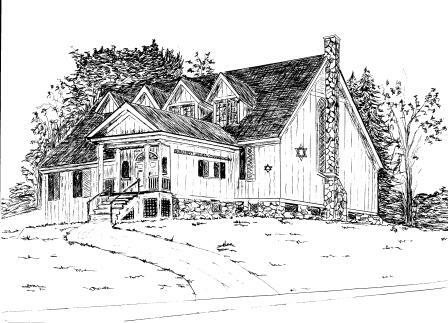 Tracing back the story of BHC on its Ninetieth Anniversary one becomes aware of the tremendous effort and dedication of relatively few individuals to sustain a viable Jewish center on behalf of Jews spending their summers in Bethlehem. In this sense, the past is just another version of the present. The following article is just a beginning towards a more comprehensive history of BHC. Documents related to BHC’s ninety-year trajectory that were handled down from one generation to another, ended up on my desk just a few weeks ago. It is impossible to evaluate these precious materials in such a short period. We also assume that many documents were lost in the course of time or that they may still be in some private homes or public archives waiting to be retrieved. The archive includes minutes of the BHC board from 1954 to the present, minutes of the Sisterhood since its inception on September 12, 1938 to 1972, some documentation related to the National Hay fever Relief Association, scattered correspondence and financial documents (few of the latter dating back to as early as 1946). In preparing this text I benefitted from Lee Bagdon’s valuable collection of raw materials from 19thand early-20th century local newspapers and from the archives of the Town of Bethlehem and Grafton County that she put together towards the preparation of a Landmark Designation proposal that was never submitted. I am grateful to Lee for her unfailing efforts in collecting these rare sources that allow for a reconstruction of the history of the building and the origins of BHC. In addition, I benefitted from the generous assistance of Mr. Paul Hudson from the Bethlehem Historical Society in the reviewing of the Town Records. Though fragmentary and unordered, the scattered documentation that survived the vicissitudes of time allows us to trace a brief recounting of the history of BHC. This text needs to be fleshed out by further research, perhaps towards BHC’s Centenary in 2020. A more detailed account and deep analysis of this fascinating chapter of American Jewish history will be possible, once the available documentation is properly handled and catalogued, a process that we have just started this summer. Further research will also allow the congregation to contact the large number of descendants of its founding mothers and fathers. The present day synagogue premises have their origin as the Protestant Episcopal Church of Bethlehem. The original sanctuary of the Protestant Episcopal Church opened its doors to congregants on July 8, 1877 and was known as the Church of the Nativity. The Bishop of New Hampshire, Right Rev. W.W. Niles consecrated it on July 28, 1880 (The White Mountain Echo, July 24, 1880). It was located on the grounds belonging to ex-Governor Henry Howard of Rhode Island who also owned the Buckeye Cottage that was contiguous to the church. A sketch for the Bethlehem Echo shows the church just behind the Buckeye Cottage and I found records of the being lifted in 1895. I, therefore, thought the church had been moved from the lot on which Lon Wesson’s house stands to its present position. But later found records in the town hall that dates Lon’s house as being constructed a few years before the 1895 church renovation so it seems the sketch is an artist’s rendering rather than an accurate site depiction. Of course it’s possible that the town records are incorrect and that the building was moved from its original lower grounds on the north eastern corner of Strawberry Hill and Main streets to an upper level in the same lot, i.e. to the more southern location where the present building stands. In the same year, on January 15th 1895, the Harris Manufacturing Company and Corporation of Rhode Island, a company owned, at least partly, by Governor Howard and his heirs, transferred the ownership of the grounds of the church to the Trustees of the Protestant Episcopal Church of New Hampshire. The deed indicates that the lot will be used “exclusively for the purpose of erecting and maintaining thereon a church edifice” from which one can infer that the structure in the upper ground was a substantially new one. A drawing of the church from September 1895 shows the addition of a very tall bell-tower located above what is today the northern entrance to the synagogue. The actual possession of the building by BHC, however, appears to have been delayed due to legal issues by three years. On July 10, 1926 an announcement in The White Mountain Echo indicates that the Church of Nativity was still providing Holy Communion. Therefore, at least as late as the summer of 1926 the building still functioned as a church. Thus, the heirs of the Harris Manufacturing Company had to rescind this condition before the Court to allow the church to complete the transaction. Therefore, the synagogue could not have started to function as such until late 1928 and in fact, 1929 seems to be the first year of activity. One has to also consider the time needed to implement the physical reforms necessary to transform a church into a synagogue. A constant concern for the maintenance of the building of the synagogue is voiced in most meetings of the board.&nbsp; A House Committee existed in the 1950s that reported yearly to the board to the effect, for example, “that all the equipment and facilities of the congregation are in good order” (minutes of meeting on July 23, 1958).&nbsp; Such an old structure in an area with the harsh weather of the White Mountains always presented new challenges. &nbsp;On August 10, 1942 the Sisterhood of BHC was requested by the President Mr. Heimovitch and Mr. Stein “to underwrite the cost of laying a wooden floor in the vestry which was badly needed.”&nbsp; A motion to support his effort was approved unanimously.&nbsp; A document dated December 6, 1944 by the consulting architect James J. Murphy of West Hartford, Connecticut, describes the work to be done at “Temple Beth Israel” as BHC was sometimes referred to in its first years of existence (see more below).&nbsp; No documentation is available regarding the realization of the work described in this document.&nbsp; In the absence of minutes from the board for this period, and considering the stress of the Jewish community during those years, with the horrible news arriving from Europe, it is hard to assess if anything was done in terms of construction work. It was only in 1999, under a totally new and young leadership that the building was finally revamped, ensuring its survival for future generations. Clearly, the presence of Jews in Bethlehem, predates the purchasing of the synagogue building or even the acquisition of the first Torah Scroll in 1920. Seventy-seven “Jews of Bethlehem” appearing as donors in the 1920 list is certainly a substantial number for a town as small as Bethlehem. By 1925 there was therefore a critical mass of Jews with a fairly long tradition of summer stays in Bethlehem which allowed the consummation of the bold initiative of buying such a prominent historical building. In fact, one of the earliest records of the substantial Jewish presence in Bethlehem can be traced back to 1910, when Isidore and Sadie Lusher purchased the Altamonte Hotel. Isidore was born in Russia in 1875, immigrated to the USA in 1899 and settled in NYC where, according to the 1910 census, he was a merchant of dry goods. His wife Sadie was born in Russia too, in 1880. The Town Book Ledger shows the 1910 purchase (and not 1916 as it appears in several sources) and that the Lushers transferred their property as early as 1917 and 1918 to Mr. Fred Lewis, the town clerk of Bethlehem. However, the Bethlehem Directory for the years 1920-1922, 1923-1925 and 1926-1928 continues to register Sadie, Isidore and Aron Lusher as owners of the Altamonte with permanent residence in 46 W 17th St in NYC. There is hardly any doubt that many of the guests of the Altamonte Hotel were Jews and that a minyan gathered there. That barely ten years after being in America this young couple would purchase a hotel in Bethlehem, New Hampshire shows the amazing speed in which these new immigrants explored their new land and its opportunities. Not a word is said about the “suitable building” being formerly a church. From the very beginning women played an essential role in BHC. As Ruth Pactor states, recalling the history of her mother Sara Herskowitz, “[women] left their husbands and children for those six most critical weeks, giving up the conveniences of their homes and apartments to live among strangers who couldn’t understand this invasion from the big city.” (Pactor 1973, p. 137). Jewish women of means started to frequent the Bethlehem hotels. A list of guests arriving to the Sinclair Hotel in 1920 includes among other names that sound Jewish, a certain “Mrs. S. R. Schwartz of New York,” and there were probably other Jews arriving prior to 1920 who just did not identify themselves as such. The identity of “Rabbi Barsel,” one of the first Rabbis mentioned in the BHC records is uncertain. It is hard to believe that it was Rabbi Chaim Barsel, born in Safed, Palestine in 1870 who arrived to the USA at the beginning of the 20th century and is the grandfather of the extremely distinguished Philadelphia lawyer Richard A. Sprague (see Fearless: the Richard A. Sprague story by Joseph R. Daughen, American Bar Association, 2008, p. 38). More plausible is the figure of Rabbi S. Barsel or Barzel, who appears as a resident of 912 Court, Portsmouth, Virginia, (American Jewish Year Book, 1933-4, p. 381). A year later he moved to become rabbi at the B’nai Jeshurun synagogue in Strawberry Mansion, Mount Airy, Philadelphia (American Jewish Year Book, 1934-5, p. 540; see: Images of America – Strawberry Mansion: the Jewish community of North Philadelphia, by Allen Meyers, Charleston, SC: Arcadia, 2000, where Rabbi Barzel is listed as active in the 1940s). Periodizing the history of BHC at this stage of our research is adventurous. With caution one can say that the early period from the foundation up to the late 1930s is characterized by a growth in membership. Some writers of the history of Bethlehem contend that the increasing number of Jewish summer vacationers saved the town during the 1929 recession. The years of World War II (1938-1945) are documented only in the records of the Sisterhood’s meetings. Understandably, the concerns over the relatives of the community members and the soldiers in the front put aside other concerns. Anxious long lines outside the post office of Bethlehem waiting for the arrival of the mail from Littleton every afternoon are one of the scenes best remembered from this period. The post-war period represents a new era. No later than 1946, BHC had rented office space at 320 Broadway, in New York City (room 1217- 18). We know this from the letterhead used for a letter of examination of the content of the safety vault at Littleton National Bank by the officials of the congregation, President Frank Stein, Jacob Grossman, Philip Basser and Isidor Fine, on August 19, 1946. The vault included American Bonds going back to 1942. When President Frank Stein passed away suddenly in 1948, vice-president Philip Markus Basser (born in Krakow in 1892, in the Austro-Hungarian empire, now Poland) stepped in for the longest presidential tenure in the history of BHC, lasting almost twenty years until his death in 1967. His dominant presence, backed by a solid financial base (he was one of the owners of Textiles Corporation in Miami Beach) is noticeable in the minutes of the board. Many BHC business meetings during this period took place not in the NYC office but rather at the lobby of fancy Miami Beach hotels. Overall, it appears that the efficient and orderly management of the community was due to Basser’s corporate background and experience. Besides the officials, during the 1950s and 1960s BHC employed several rabbis and other officials for payment during the summer session that extended from early July to the High Holidays, depending on the year. In those years when the Jewish holidays were too late in the Gregorian calendar the tendency of many members was to return to their permanent homes. The records indicate the appointments and payments of summer personnel, the negotiations with them, the terms of their tenure and more. Further research on the personalities of these clergy persons may allow for a better profile of the religious life of BHC. Unlike his predecessors, Dr. Fisch established himself in Bethlehem year around. During his period the community was more active than ever during the winter months, with celebrations of the holidays of Hannuka, Tu bishvat and Purim that were hardly celebrated in Bethlehem before. New types of social, educational and cultural activities were also enacted during this period under the umbrella of the ‘Culture Club,’ (established, and apparently funded, by Paul Pactor) as well as the development of ‘The Star,’ the newsletter of BHC. The very recent history of BHC is fresher in the memory of the present-day members and we will not discuss it here. The passing away of Dr. Fisch symbolized the end of another era in the history of the community. A new generation of young American Jews “who did not know Joseph” took over the leadership. The renovation of the synagogue building was one of the major undertakings of BHC during this period under the initiative and management of President Margery ‘Moocho’ Salomon, the first woman to head BHC’s board. In addition, the total parity between women and men was attained during this period that also saw serious attempts to revamp the synagogue services to the needs of a new generation whose Jewish education and knowledge of Hebrew is different than in previous generations. With live memories still around, a further effort of oral documentation should be carried on in order to preserve this information in this paper-less Internet period. Many episodes in the life of BHC are hidden between the lines of the minutes and letters of the community archive and are fascinating to retell and analyze. We have selected one of them for this article and it follows hereby. Since times immemorial, providing kosher meat was one of the essential functions of any Jewish community and Bethlehem, New Hampshire was no exception. However, the definition of standards of kashrut was always a matter of controversy. These controversies, on the surface, were religious by nature. Yet, when one digs into the arguments around kashrut, two issues arise: one is power and the second is money. Control over the selling of meat was a lucrative business, usually a means to recruit money for the congregation’s institutions. Behind that, the public weight of the rabbis who authorized the kashrut was at stake too. By accepting the signature of a certain rabbi, the consumers implicitly declared their trust on his authority. BHC and its meat supplier, the Bethlehem Meat Market collided sometime in the summer of 1958. A letter dated October 17, 1958, and addressed to Mr. Ralph Schank of New Haven, Connecticut, one of the owners of Bethlehem Meat Market, was written following “the difficulties that have transpired in Bethlehem this past season.” In the same letter, Schank is offered by the trustees of BHC “to straighten out matters amicable” and “learn whether or not you intend to continue under the supervision of BHC.” From this correspondence it is clear Mr. Schank rebelled against the authority of BHC’s leaders and took an independent position regarding the supervision of kashrut. A swift reply by Mack M. Mussman, attorney at law from Littleton representing Ralph Schank and Sidney Hoffman, owners of Bethlehem Meat Market, dated November 28, 1958, showed no signs of compromise. No further documents related to this incident were found so far, including in the minutes of the board for that year. That the supply of fresh kosher meet to BHC members was discontinued sometime after the late 1960s is clear. One of the main markers of Jewish identity, the need for kosher meat, apparently stopped to be of a great concern for the BHC members. The passions over the quality and supply of kashrut that rose in 1958/9 were a matter of a seemingly far past. During the 1950s, most of the meetings of the board of BHC were held jointly with the organization that, out of what one would call nowadays politically-correctness, shifted its name from HHFA to the National Hay Fever Relief Association (NHFRA). The definition of “non-sectarian” was added to the letterhead of the organization upon changing its name. In her article of 1973 about the National Hay Fever Relief Association, Miss Sarah Masor, then executive director of the NHFRA, never mentions the “Hebrew” component of the original association or its strong association to BHC (Masor 1973). The very active role of Dr. Herman Blum (who died in 1973), president of the Association and its research director, in the Jewish community of Bethlehem is just one of these strong links. Documents show that Isidor Fine and Philip Basser, two pillars of BHC, had a great commitment to the NHFRA. Just as an example, Basser contributed $1000, to the 1967 NHFRA/BHC, joint appeal campaign. The National Hay Fever Relief Association also shared offices in NYC with BHC (see above) but at a certain point it moved to another premise. Stationary addressed at 50 Broadway, NY, NY 10004 is found in the BHC archive. By 1973, Miss Masor reports that the NHFRA office is located at 401 Broadway, NY 10013. Miss Masor was probably quite a character and her association with NHFRA starts very early and continued until at least the late 1970s. Her name already appears as executive secretary of the New York office of the NHFRA in 1951. She was apparently the daughter of Dr. Nathan Masor, who appears in the letterhead of the organization as one of the two consultant physicians of the NHFRA. The NHFRA was instrumental in establishing several buildings, wells and other facilities but the camp, established under Masor’s directorship on Whitefield Road (Route 142) was the jewel in the crown. The NHFRA did not last for long after 1974. Rich documentation about the NHFRA found on display at the Bethlehem Historical Society shows that by the mid-1980s all the grounds and premises of the summer camp in Route 142 were for sale. Miss Masor, whose lifelong dedication to the NHFRA is clear, also acted as an almost private secretary for Philip Basser during his long tenure as President of BHC. Basser lived most of the year in Florida and in NYC. Conspicuous exchanges of letters between Basser and Miss Masor from the late 1950s up to 1968, are in the archive of BHC. The letters concern the ordering of plaques, sending letters of condolences, asking for and collection of donations, handling of checks, payment of taxes, etc. Much more is left to be told about BHC than what we could include in the lines above. Other interesting issues could be elaborated here and will be left for another opportunity, such as the well-documented anxiety that followed the beginnings of the “Orthodox” Jewish vacationing in Bethlehem in the late 1950s and the threat of the establishment of a new synagogue. We could also embark in a study of the individual names of picturesque figures of American Jewish history that adorn the walls of BHC. One short example may suffice for the moment. Judge Jonah J. Goldstein, whose prominent commemorative plaque is set on the wall next to the Aron Hakodesh, had a very distinguished public career as lawyer, judge, scholar of law and politician (a Republican turned Democrat) in New York. On August 23, 1929 when the news regarding the slaughter of Jews at Hebron had reached the United States, the Emergency Fund for the Relief of Palestine Sufferers met and raised funds. In September, the Fund nominated Judge Jonah J. Goldstein and his wife, Mrs. Harriet B. Lowenstein-Goldstein, comptroller of JDC, to go to Palestine and distribute the funds. On their way, the Goldsteins stopped over in London and arranged for the coordination of British and American efforts. Judge Goldstein was a champion of civil rights well before the Civil Rights movement. In 1943 he was among the first lawyers to renounce his membership at the American Bar Association upon the ABA’s rejection of membership to a black lawyer. In 1946, he was president of the Great Street Boys Association, an interracial sports organization. Yet, in spite of his respectable social position, Judge Goldstein the Bethlehemite vacationer saw nothing untoward in accepting the important nomination as judge for the Miss Sun-Fire Beauty Pageant organized in Bethlehem in 1950 (with him as judge was his colleague, the renowned attorney and writer Louis Nizer, son of Joseph Nizer and donor of the Rabbi’s cottage in 1965). He also entertained the ladies of the BHC Sisterhood with talks spiced, as the minutes testify more than once, with his unique “humor.” Many Jewish institutions honored Judge Jonah J. Goldstein for his life of community service; for example on April 17th 1966 Temple Emanuel in New York organized a major event in his honor. It is worthwhile to end by stressing several points that are enlightening, not only to understand the past, but also to better appraise the present and the future. Six concerns cut through the history of the community in all periods: constant financial anxiety, generational gaps, youth education, a commitment to Israel, the remembrance of the dead and the fostering of good relations with the gentiles. Maintaining the premises, paying for the professional personnel that included rabbis, shamashim, cantors and youth directors, posed a constant burden on the budget of the congregation that was based on the voluntary donations of members and friends (including non-Jewish business from the area). Earlier periods of prosperity and high numbers of attendance allowed for the creation of a fund that provided for fixed revenues. Gracious donations of land and the house of the Nizer family (1965) enriched the community. Starting with the 1970s, one can see a decay in funding, forcing the congregation to slowly sell its assets. Generational gaps led to a decrease in the number of summer vacationers. But even among the vacationers who continued to arrive there was a drop in the attendance at synagogue services, as the role of religion in American Jewish identity started to erode. Changes in the language and performance of the services in the 1990s were the remedy proposed for the drop in synagogue attendance. Linked to this last point was the preoccupation of the mentors of BHC to maintain youth activities in the form of a Hebrew school or other social activities that will keep the young Jews affiliated. The anxiety of assimilation runs through these educational concerns. Many materials of the BHC archive emphasize the important role of the community in providing social sustenance in moments of grief. Again, as with providing kosher meat, taking care of the dead was among the crucial goals of the Jewish communities. BHC had for a short periods a hevra qadishah(burial society), and discussions about a cemetery are found in the minutes from early periods. But no Jewish cemetery was established in Bethlehem until 2006, when through the efforts of Harold Friedman and Kim Pearson, a dream of many generations of Bethlehemite Jews was finally realized. The board meticulously sent extensive and personal letters of condolence to families of mourners. A concerted effort to honor the memory of those who contributed to the community and the officials who served it was expressed in an intricate business of plaques that can be seen adorning most of the walls of the sanctuary. The archive includes countless letters and receipts related to the plaques. Mr. Aldrich has been, and is, a particularly good friend of the Jewish community of Bethlehem. It is incumbent upon us, therefore, to make sure that he does not suffer through the carelessness or unwittingness of one of our summer visitors. We appeal to you, especially at this season [i.e. High Holidays], to remedy an unfortunate occurrence and restore Mr. Aldrich’s confidence on Jewish responsibility and dependability. Please refund to him the $36.00 which he paid to Mrs. Halpern when he cashed the check for you in good faith. Ruth Pactor (p. 139) also touched this point very clearly: “From their early arrival on the scene in Bethlehem, the Jews have always made a concerted effort to become a part of the community by offering their assistance, but this was not always readily accepted.” She mentions for example, that many Jewish entertainers, some of them working as staff members of the Jewish-owned hotels (Sinclair, Park, View and Perry House), appeared in fundraisers of the Catholic Church held at the Casino of the Maplewood Hotel. Jews also purchased “many tickets to make these events a great success.” Moreover, the BHC Sisterhood (she calls it ‘Ladies’ Auxiliary’) consistently fundraised for the Littleton Hospital, running a weekly bingo for this purpose. We have tried to illuminate some aspects of BHC history on the occasion of the Ninetieth anniversary (of the purchase of the first Torah Scroll, as we have seen). Hopefully a more detailed version of this text will be developed in coming years. Remembering the mothers and fathers of BHC of all generations is not only a duty to be observed by the routine recalling of their almost anonymous names on their yorzeits or during Yizkor services. We have to cherish their dedication to the Jewish community and thank them for their efforts on our behalf with the only deed that they would expect from us: to persevere and maintain the fundamental ideals of the Jewish people alive for the benefit of the community at large. Brickman, Rabbi Seymour. ‘A history of the Jewish community,’ in: Bethlehem New Hampshire – 1999 Bicentennial Edition, ed. by Gregory C. Wilson and Mike Dickerman. Littleton, N.H.: Bondcliff Books, 1999 [originally published in 1973], pp. 135-136. Hoberman, Michael. How Strange It Seems: The Cultural Life of Jews in Small-Town New England. Amherst: University of Massachusetts Press, 2008. Masor, Sarah, ‘National Hay Fever Relief Assn,’ in: Bethlehem New Hampshire – 1999 Bicentennial Edition, ed. by Gregory C. Wilson and Mike Dickerman. Littleton, N.H.: Bondcliff Books, 1999 [originally published in 1973], pp. 140-141. Pactor, Ruth. ‘They came to breathe,’ in: Bethlehem New Hampshire – 1999 Bicentennial Edition, ed. by Gregory C. Wilson and Mike Dickerman. Littleton, N.H.: Bondcliff Books, 1999 [originally published in 1973], pp. 137-139. Taylor, Harrie Whitcomb. Early History Bethlehem, N.H. 1960, reprints by The Bethlehem Public Library 1983, 1988. Ward, Elizabeth Anne. ‘Jewish Guests and Neighbors,’ in: Images of America – Bethlehem. Charleston, SC: Arcadia Publishers, 2000. Don’t know what she means by “left their… children.” From sisterhood minutes it is clear that the children come with the mothers to Bethlehem and participate in activities at BHC.